Last year’s victory by the conservation community to block the building of a road across the Serengeti was appealed by the government of Tanzania. Continued filings by the lawyer representing the interests to conserve the park have been submitted. On June 10, the East African Court of Justice announced it will make its decision public at an open court session at the East African Community Headquarters in Arusha Tanzania. The decision is to be made on July 29th, 2015. 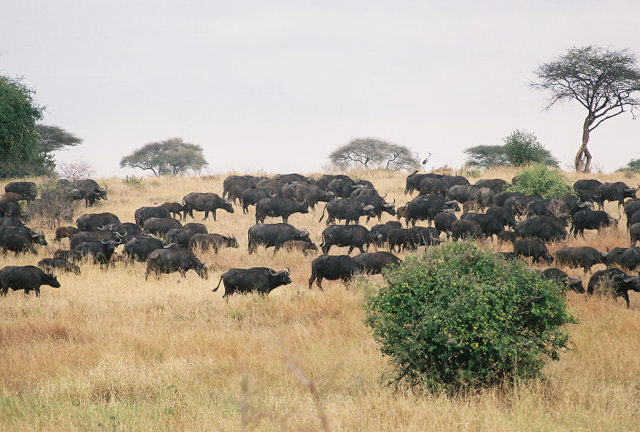 The Africa Network for Animal Welfare along with supporters from Serengeti Watch, Love Animals, and many others including ANAW-USA, remain hopeful that the appeal will be denied closing another chapter on the continued pressure for commercial development of this wilderness area. It is our mandate to forge on to protect the world’s largest migration of this kind for the millions of animals migrating between Tanzania and Kenya. The Serengeti Campaign highlighted on Love Animals website has come to an end and I want to thank everyone who contributed. The Africa Network for Animal Welfare — USA and its companion organization in Nairobi continue to monitor the court decision. Over $1,000 was raised and added to the large share already contributed by Serengeti Watch. While we did not reach our goal, each and every donation is recognized as a powerful statement against the destruction of unique African habitat. Monitoring the court decision, at this stage, means waiting for the court to announce its decision on the appeal brought by the Tanzanian Government that would overturn the earlier decision preventing the construction of a road across the World Heritage Site that is the Maasai Mara and the Serengeti, a vast region within the countries of Kenya and Tanzania. I will post news that is forth coming. NPR’s story featuring four African Presidents calls for diplomatic pressure to be brought to bear on China as well as night vision goggles and helicopters. Poaching elephants continues, even in the face of more publicity and awareness throughout the world. The Wall Street Journal publishes an Opinion piece by Tony O. Elumelu, a philanthropist in Lagos, Nigeria. Mr. Elumelu’s comments are about the U.S. Africa Leaders Summit in Washington D.C. that is going on this week. It is the coincidence that brings together the panel of four African Presidents interviewed by NPR. Elumelu’s headline is “Africa is Open for Business, Ready for Investment”. He extolls the ventures of entrepreneurs across the continent and the shift for companies like General Electric, Wal-Mart and IBM to expand efforts for capital investments and ideas impacting Africa’s economy. Still, Africa experiences internal grabs for power and land, overwhelming population growth, the drought and mass killings of wildlife. These are factors requiring continued focus by the developed economies of the world if Africa is to grow a middle class. Hostilities need to be squelched for tourism to return, a significant employment engine throughout Africa but especially the in coastal locations on the Indian Ocean. And in all this, Africa’s strategic importance to the United States becomes more evident. Saving wildlife is not a simple task. It will take support of richer countries to encourage rule of law and the development of governance systems in countries as young as the ones in East Africa. The world seems more complicated everyday. Somehow the countries that are rich, through policy as well as philanthropy, must transfer its capitalistic systems with sufficient vigor to build a middle class or the alternative of poverty, chaos and division between the haves and the have-nots is all that will be left. A recent Washington Times article by a Senior Fellow at the CATO Institute caught my eye this week. BANDOW: Obama’s ivory-trade regulatory overkill – Washington Times. I’m a free-market, private property advocate, but this report about President Obama’s move to ban ivory sales in the U.S. doesn’t dig deep enough into what is really transpiring in Africa. I am disappointed that the article misses the point about our national security interests. Having lived in Kenya last year during the Westgate Mall massacre, I can tell you there were several observations about Al Shabab’s involvement in elephant poaching and killing rhinos for quick cash to buy weapons and ammunition. Another omission was the fact that sports hunters, individual Americans, will be permitted to bring their ivory trophies back to the States. Each hunter can kill two elephants per year under the proposal and keep the tusks as long as they are not commercialized. Actually, this is not a change from the previous rules. And I have to take issue with the claim that it is easy to determine the age of ivory. There are many ways new ivory can treated to look old. The end-stream-market-price is as high as the price per ounce of gold. Demand and price motivates counterfeiters. The flow of merchandise to high-end stores from Manhattan to low-end garage sales and flea markets in Arizona and Colorado continues unabated. The U.S. is the second largest consumer of ivory. China is the first. The last issue I have with the CATO article is how it dismisses the problems another country experiences in controlling animal crime. It is troubling to see a respected bastion for conservative American ideals and thought demonstrating such lack of civility, or is it humanity. What right do we have to weigh-in on the topic of killing iconic animals to the brink of extinction when a country like Kenya is demonstrating the will to stop the slaughter? I can only assume the Institute’s argument rests on the belief that private individuals can, in the pursuit of happiness, kill these animals, 1) because they can afford to do it and, 2) it is a positive function of the free market and invisible hand, that forces of capitalism will generate conservation funds to save the rest of the species. Regrettably the past 50 years of Kenyan independence doesn’t support this notion. Kenya embraces democracy and socialism. In the gap between democracy and socialism there is the ugly head of corruption. The rules don’t play out the same way under these circumstances. Let me point out that Kenya does not permit hunting. Yet, the demand for ivory is so strong, curbing the slaughter of animals in Kenya is very very difficult to accomplish. Last month, January 2014, a rhinoceros was killed in Nairobi National Park for its horn. Some people were bold enough and knew enough about the landscape to enter the gated and guarded park, find the rhinoceros, kill, butcher and escape. The park shares its boundary with the largest city in East Africa. How does this happen? Where does it end? Poaching ends, in part, with symbolic gestures like banning the sale of ivory in the United States, to show solidarity with other countries, that America stands behind efforts to save the species. The truth be known, if you read the small print, real antique ivory like a world-class collection in Denver, Colorado, is safe from destruction and eligible for sale. 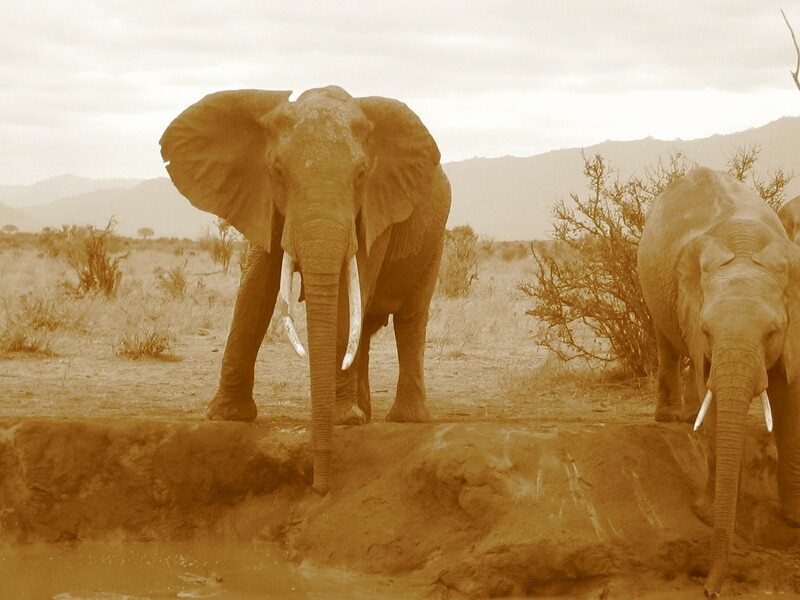 So to is the right of hunters to bring legally harvested ivory back to this country. Support the ban. Stop the criminals. Find the middle. As we end 2013 an important meeting has concluded among Kenya’s leaders committed to curbing wildlife crime, especially poaching. The meeting took place at Amboseli National Park on December 20. John Mbaria, communications expert for the Africa Network for Animal Welfare (ANAW) reports 76 participants attended representing the Judiciary, Kenya Revenue Authority, Kenya Police, Kenya Wildlife Service (KWS), Ministry of Environment, Water & Natural Resources, Ford Foundation, Kenya Tourist Board, Mombasa and Coast Tourism Association, Lusaka Task Force, Interpol, Office of Director of Public Prosecution, South African Embassy, U.S. Embassy, Kenyans United Against Poaching and several local and international conservation NGO’s including Lewis & Clark’s College of Law of the U.S. of A. The meeting was remarkable in that for the second time this year, the first was with Wildlife Direct and KWS officials, Kenya’s leadership is demonstrating a way forward to stop elephant and rhino poaching. The meeting brought renewed focus to the mutual priorities between government, the judiciary and economic interests to respond to well planned criminal activities that go beyond the national borders of Kenya. Poaching finances terrorism. Big rewards are paid to the end producers, the crooks selling illicit ivory and rhino horn. It was reported at this meeting that the street price for rhino horn per kilo has reached $65,000 U.S. about 5.5 million Kenya Shillings, A full grown rhino horn can weigh as much as seven kilos. Yet, the conviction and fines imposed on poachers did not exceed 40,000 Kenya Shillings, about $500 U.S. The meeting concluded with several pages of agreed upon action steps that will be pursued by the various governmental agencies and conservation groups immediately. It is too early to boast of success but the meeting was a powerful show of the countries resolve to do something to effectively address wildlife crime.